"It's a Serious Offense to Mock God"
After posting his letter, Henderson has heard from a number of representatives of the State of Kansas, most of whom applauded his efforts. "Thanks for your comments about the Flying Spaghetti Monster," wrote Janet Waugh, a representative from Kansas' District 1. "I think your theory is wonderful and possibly some of the majority members will be willing to support it." "We have received thousands of emails from scientists around the world," wrote Carol Rupe, a representative of District 8. "At first, they all tried to explain good science to us. After the vote last week, however, they have resorted to calling us hillbillies and morons. And those are the nice letters!" But not all the responses were so positive. Kathy Martin, of District 6 had this to say: "It is a serious offense to mock God." 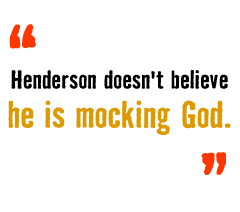 Henderson, who said he wrote his letter for his own amusement as much as anything else, doesn't believe he is mocking God. He's mocking the ignorant. "I don't have a problem with religion," Henderson says. "What I have a problem with is religion posing as science. If there is a God and he's intelligent, then I would guess he has a sense of humor." Henderson's open letter concludes: "I think we can all look forward to the time when these three theories are given equal time in our science classrooms across the country, and eventually the world; One third time for Intelligent Design, one third time for Flying Spaghetti Monsterism, and one third time for logical conjecture based on overwhelming observable evidence." Unfortunately, he didn't get his wish. Following a 2007 vote to again alter the definition of science in Kansas, there is only one version of the origin of the human species being taught in Kansas public schools: Darwin's. No word yet on whether the Pastafarians intend to follow through with their threat of legal action. Russ Pitts doesn't believe in isms. His blog can be found at www.falsegravity.com.